Happy Groundhog Day! This year started off rather well and we had over 8000 classifications. For January 2015, we had 8414 classifications of 619 storms from 417 citizen scientists (45 returning and 372 were new this month). 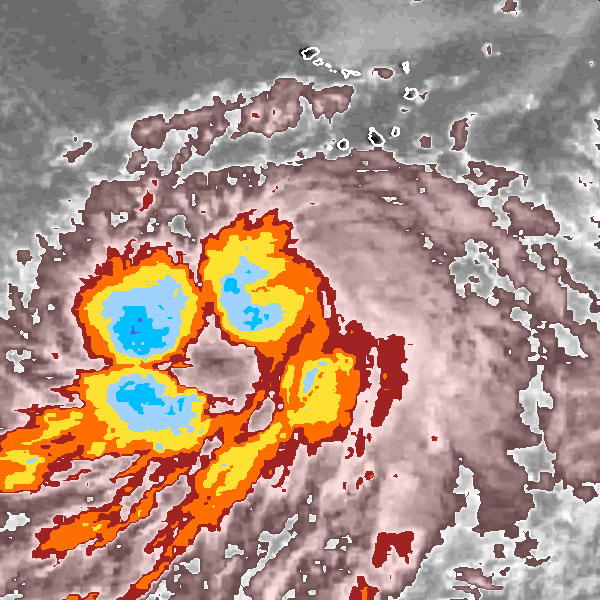 Here’s a recent image from the CycloneCenter talk page. It shows a ring of convective cells that may appear to be an eye, but not in the traditional sense. Have you seen any interesting or confusing images? If so, ask your questions on talk and someone from the Science Team will respond soon. We really enjoy engaging using talk. It is how we find many of the more interesting storm images. Thank you to all for making CycloneCenter.org a great success!! Top 10 most active citizen scientists for January 2015. The Bretarn Board: Most active citizen scientists overall. Baja Award: Most active citizen scientists each month. Keep coming back to CycloneCenter.org site to help make 2015 our best year! Also, stay tuned as we should reach 400k classifications soon! I am a meteorologist at NOAA’s National Climatic Data Center in Asheville, NC. My research interests include using satellite data to observe hurricanes, clouds, and other climate variables. *******Disclaimer******* The opinions expressed in these blogs are mine only. They do not necessarily reflect the official views or policies of NOAA, Department of Commerce, or the US Government. How do tropical cyclones form? This is the blog for Cyclone Center. Visit the main site at cyclonecenter.org or find out more about the Zooniverse at zooniverse.org.